That’s hello in German if you didn’t know. Thought I would do a German greeting in honor of today’s recipe. 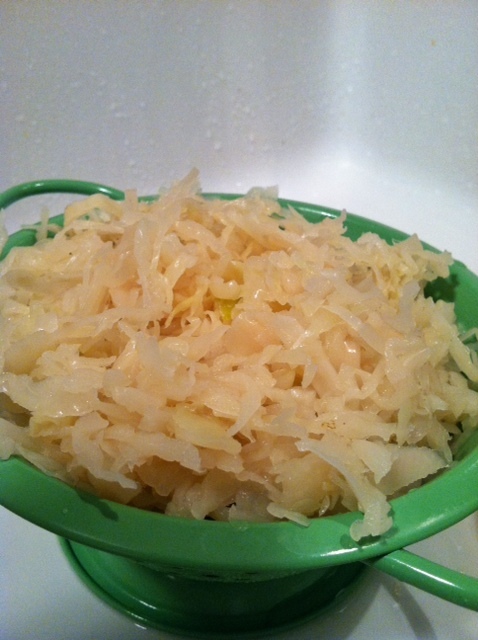 Sauerkraut. I know, it sounds about as appealing as taking two years of German in college (how did I pass that?) but keep reading. First of all, I’ll tell you how I passed. I took the class with my friend Katy as we were looking for something different I guess than say….Spanish. Which could have actually helped me in numerous ways in the future. Anyhow, things weren’t going well for anyone in the class but particularly for us. I was sure I was going to fail the final exam, after all, I couldn’t speak, understand or write more than 25 words in the German language. Feverishly, I showed up for the exam with my small group of class mates. But guess what? Our professor didn’t show. Ever. So by default we all got A’s! Talk about a stroke of luck. Although my German vocabulary has dwindled to maybe 5 words, I figured since I am a fan of all things cabbage and Brussels sprouts, that certainly I should be a fan of sauerkraut. It’s just that I’ve never had it so it wasn’t possible. This traditional German dish has never made it to my fork. This new year I took the opportunity to bring it to the table. I was weary. It does have a very distinct aroma but I think the components of this recipe made it a keeper! Now I am not going to pretend it took the prettiest pictures but 5 non-kraut eaters ate the whole recipe so I think that is saying something. 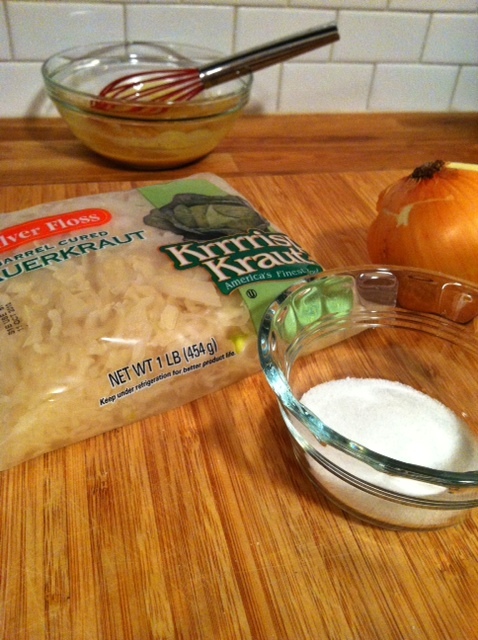 To the sauerkraut you add onion and sugar. I think that makes them less pungent but still unique. 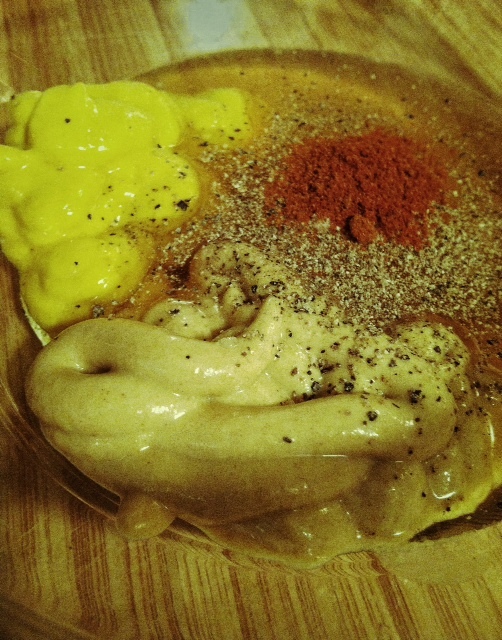 Mustard, dijon mustard, honey, cayenne, salt and pepper were the building blocks for the mustard sauce. 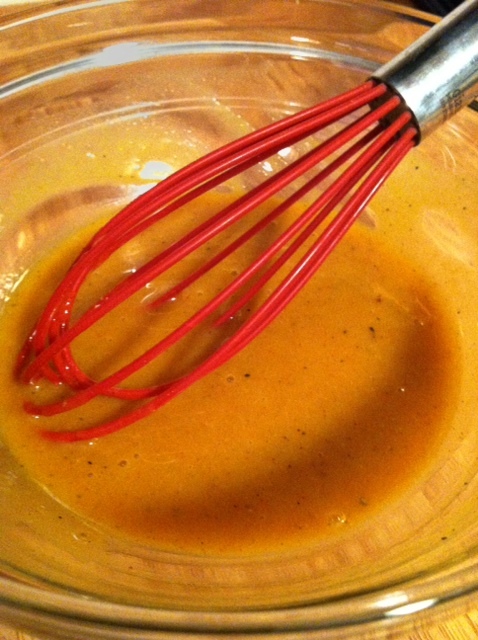 Whisked together and ready for dipping. 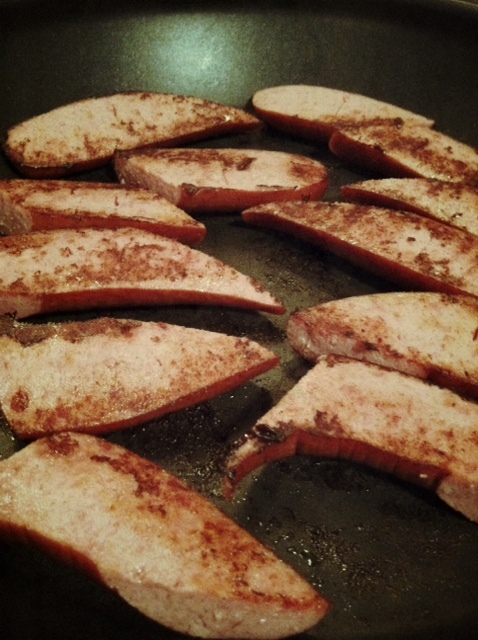 The kielbasa sautes quickly in the skillet. 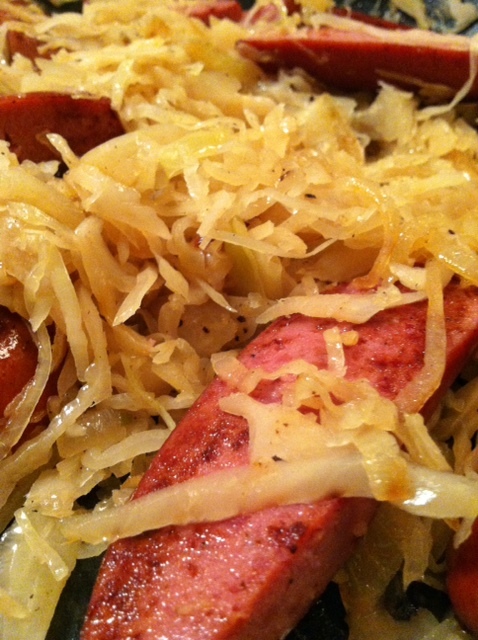 After you remove the sausage from the pan you saute the onion mixture with the kraut. Once you’ve combined the two you are ready to eat. 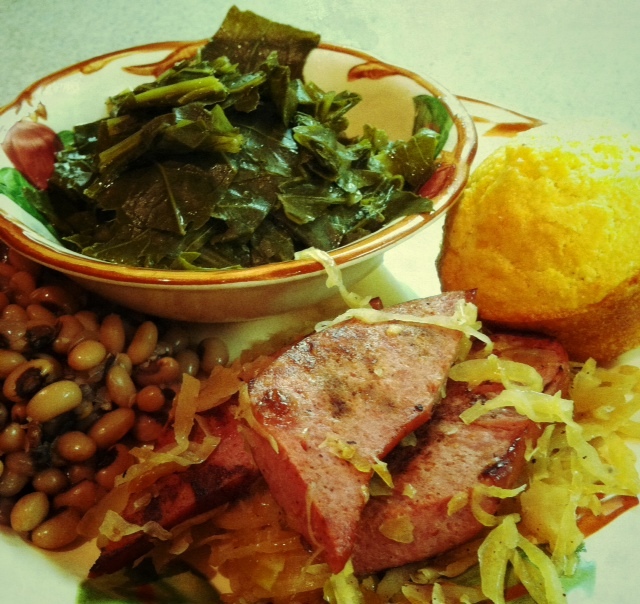 We ate this meal on New Year’s Day so we also had greens, black eyed peas and cornbread. I’m feeling lucky already. Heat large skillet to medium heat. Cut kielbasa into 3-inch lengths and cut in half lengthwise. Place in skillet and cook for 4 to 5 minutes on each side turning frequently. Remove from pan. In the same skillet over medium heat, add butter and sugar. Allow sugar to cook to a golden brown color. 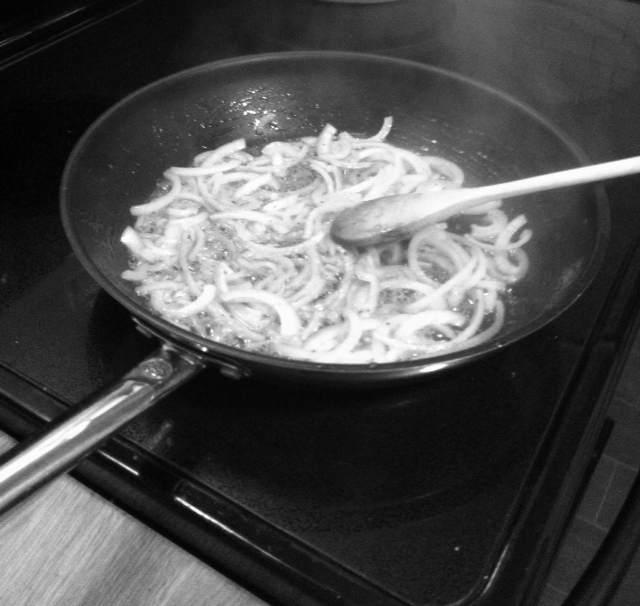 Add onions and cook until caramelized. 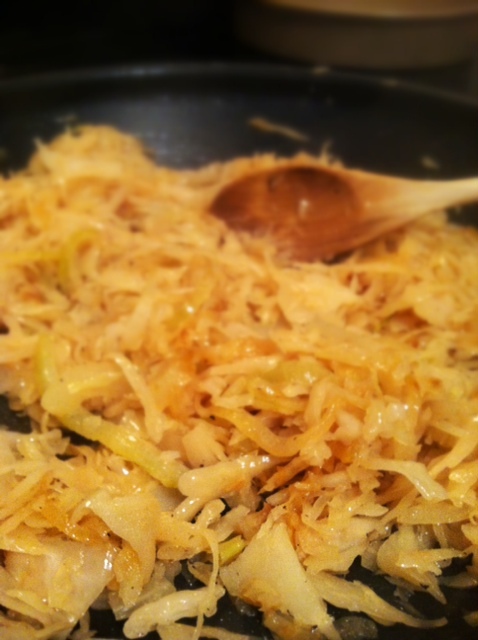 Stir in the sauerkraut and cook for 5 to 6 minutes until onions and sauerkraut are wilted and colored. 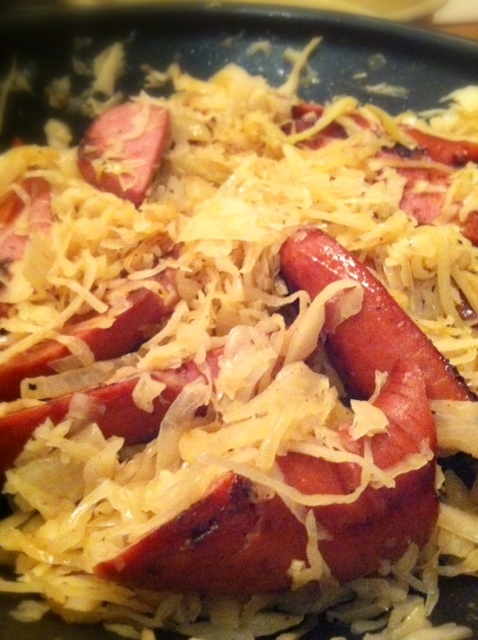 Add kielbasa to pan of sauerkraut and onions. Toss together and cook for 1 minute or until kielbasa is heated through. Transfer to a platter, garnish with parsley and serve with Honey Mustard Dipping Sauce. In a small bowl, mix all ingredients until well combined.